I’m so surprised that I liked this! It’s a powder foundation! Me, of the dewy, sheeny, barely-there finish, wearing a powder foundation! Origins ‘Brighter by Nature’ skin tone correcting makeup is a soft and creamy powder that applies really very smoothly to the skin. I kept on waiting to feel that hideous surge of dryness that you often get with powder makeup, but it never came. The finish itself is very dry and matte, but for some reason it doesn’t seem to cake on the skin in the usual way. Admittedly, I was having quite an ‘oily day’ when I used this – perhaps mature or very dry skin wouldn’t find it so comfortable. I’m going to test it on my new Guinea Pig, Mother, and see what she has to say about it. The coverage is excellent – the texture is light, but it really evens out skin tone and covers up minor blemishes and marks. As with any foundation, you’d need a concealer for very dark circles or proper spots, but overall I’d say that the Brighter by Nature does a sterling job on the coverage front. But that isn’t even the best bit! 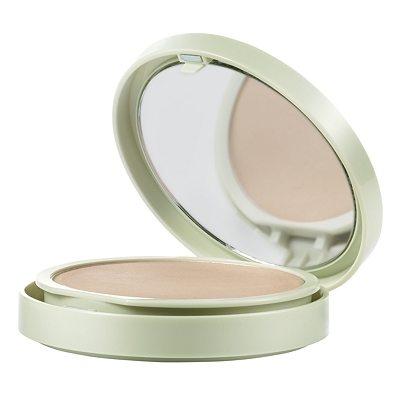 The finish is matte, but there’s a real luminescence about it – a radiance that you wouldn’t expect from a powder product. Take a look at my photo below – I know that there’s a brightening effect from the camera flash, but I also took one in dim light on the tube because I was so impressed with my skin! It’s quite nice, no? I’d be very interested to see how this works on drier skins, but for now, I’m happy that it works well on oiliness! My base lasted all day pretty much, although I couldn’t resist a few little retouches in the afternoon because I quite enjoyed being able to put on makeup so easily on the move. I’m used to messy liquids and creams, not a nice neat powder compact! Previous Post Model FAQ: Could I Be A Model?